Before having a carpet cleaned, what you need to be familiar with as a homeowner is that hot water extraction is by far the best carpet cleaning method out there on the market. Why this carpet cleaning method is particularly the most reliable and dependant, is because of a variety of benefits that come along. Hot water extraction carpet cleaning improves the air quality of your home and keeps allergies and other health problems away. Hot water extraction (HWE) has evolved in the carpet cleaning industry over the past few years, improved equipment, better techniques, and toxic free chemicals than in the conventional carpet cleaning methods. While the methods have progressed, the basic system remains the same. This solution contains a cleaning agent which is injected into the carpet face and then it is followed with a vacuum system. This action extracts the soil and spent solution, and uses high quality equipment to do the job. Not to forget, no hot water extraction system is complete without a pre-conditioning step. It involves a chemical designed to soften, saponify and let loose the oxidized oils and soils until they are ready to be extracted using the equipment. Hot cleaning solution is sprayed under pressure onto the carpet and is then extracted with a vacuum source. The unclean solution is separately stored in a recovery tank that is later poured into the sanitary waste system. This hot water extraction has the ability to flush out larger amounts of soil and contaminants off the carpet. – We use the top-quality hot water extraction / steam cleaning system in the industry. – The heated water under pressure contains a rinsing solution which is then injected into the fibers of the carpet while at the same time extraction takes place using powerful vacuum equipment. – This method will clean, rise and extract dirt and unhealthy contaminants that lies deep within your carpet. We ensure your carpet looks great once it is done! The reason this carpet cleaning method is often the choice of most customers is because it removes more contaminants than the other carpet cleaning methods. 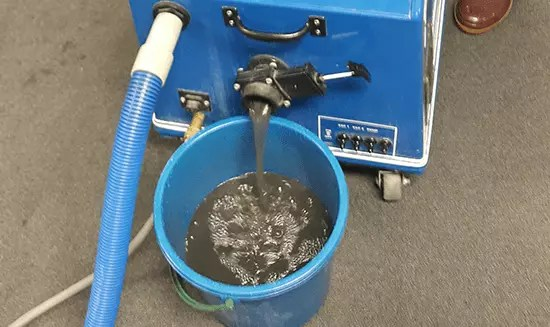 More importantly, hot water extraction is favoured by the Environmental Agency and is the preferred method of the Institute of Inspection, Cleaning and Restoration Certification (IICRC). This method can be an eco-friendly carpet cleaning approach if natural and non-toxic solutions are used. Most alternative cleaning methods rely heavily on harsh chemicals which endanger health risks for both people and pets.